I love a good horror film with a literate story that doesn’t involve scantily clad teenagers being menaced by a hatchet-wielding maniac. Some recent examples of good horror films that come to mind are The Others, The Ring, The Haunting in Connecticut, Drag Me to Hell, and Insidious (all involving the supernatural). A new one that can be added to the list is Mama, a pretty good fright fest with a modern-day ghost story rooted in a tragic event of the nineteenth century. When Mama begins, a man named Jeffrey DeSange has just gone on a murderous rampage, killing his wife, among others. Distraught over what he has done, he kidnaps his two small daughters (Victoria, age three, and Lily, age one). When he is fleeing with them on a mountainous snowy road, his car skids in an isolated area and goes off a steep embankment. Jeffrey, Victoria and Lily are not hurt, but the car is wrecked. Jeffrey takes Victoria and Lily from the car and begins walking with them in the woods, coming upon an abandoned cabin. Once inside the cabin, he plans to kill Victoria and Lily and then himself. When he has the gun held to Victoria’s head and is about to pull the trigger, something (or somebody) jumps him from behind. From then on, we don’t see Jeffrey anymore. Five years later, Jeffrey’s brother, Lucas, believes somehow that Jeffrey, Victoria and Lily are still alive somewhere and is searching for them. (Jeffrey and Lucas are both played by the same actor.) Miraculously, Victoria and Lily are found, living in deplorable conditions in the abandoned cabin where we last saw them five years earlier. Many questions remain unanswered. Lucas and his girlfriend Annabel (played by a barely recognizable Jessica Chastain, who seems to be in about every other movie these days) want to take Victoria and Lily and raise them as their own. Victoria, since she is older, is able to assimilate back into the real world, but Lily, who was only one at the time of her disappearance, still remains like an animal. She walks on all fours part of the time, won’t sleep in a bed or sit at a table, and doesn’t speak. She seems rooted to her old life in the woods. When Annabel tries to show Victoria affection, Victoria tells her to stop because “she” is watching and will be jealous. We learn by degrees that “she” is a ghost, a sort of mother figure that kept Victoria and Lily alive in the abandoned cabin for five years. Victoria and Lily refer to the “ghost” as “Mama.” In life, Mama was a mental patient with a baby in the 1870s. She escaped from the mental hospital where she was being kept and took her baby from the orphanage. While being pursued, she ran into the woods to a rocky promontory overlooking a lake. She jumped into the lake with the baby, but the baby got caught on a tree limb sticking out of the cliff and died, never making it into the lake. Mama drowned in the lake alone, without her baby. As someone in the movie explains, a ghost is a twisted emotion that has never been resolved. Mama is a ghost who can’t find rest because she is forever seeking her baby. She finds, instead, Victoria and Lily. Of course, Mama wants to reclaim Victoria and Lily, while Lucas and Annabel want to keep them. 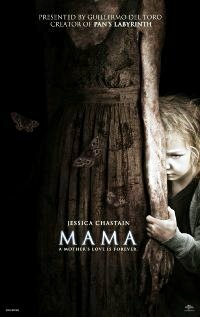 In the film’s dramatic, special effects-laden conclusion, Lucas and Annabel attempt to reunite Mama with the skeletal remains of her baby, but that isn’t what Mama wants. She wants Victoria and Lily. Scoffers will scoff and laugh and laughers will laugh at Mama (they always do), but those of us who know a good story when we see one will enjoy it, no matter how implausible. If you can stop being sophisticated and suspend disbelief for about an hour and forty minutes, you’ll have a good time.